For Chase Ultimate Rewards cardholders and for lovers and simplicity and value, the Chase Freedom Unlimited has an offer you won’t want to miss out on: The card gives you 1.5 percent cash back on every dollar of spending – with no bonus categories to enroll in or keep track of – and, for new cardholders, Chase is doubling the card’s cash back rate on every purchase for the first $20,000 of purchases. 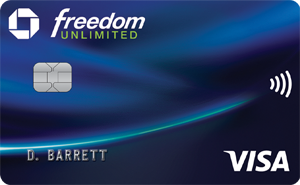 The Chase Freedom Unlimited is currently offering one of the most valuable sign-up bonuses for a cash back card. New cardholders will earn an additional 1.5 percent cash back on every purchase (3 percent cash back total) for the first $20,000 on purchases in the first year. This amounts to a potential $300 bonus if you max out the $20,000 spending cap — about double the size of the sign-up offers from many competing cash back back cards. The Chase Freedom Unlimited card comes with a flat rate of 1.5 percent cash back for all purchases, which beats the standard 1 percent rate that most cards offer. A flat-rate card also has advantages and disadvantages. Cardholders who don’t want to keep track of spending categories and spending limits, may prefer the card’s simplicity. However, with bonus categories, there is a possibility to earn more cash rewards. There are several cards on the market that can give you a better cash back rate than 1.5 percent through the bonuses they offer in categories such as grocery and gas station purchases. Moreover, you can juggle these cards with a flat-rate card to maximize your rewards earnings. Redeeming your cash rewards with the Freedom Unlimited card is as seamless as earning them. Chase allows you to redeem any amount at any time, and gives you have a variety of redemption options – as a statement credit, a deposit into most checking and savings accounts, or for gift cards, travel and merchandise on Amazon.com. Ultimate Rewards earned on the Freedom Unlimited card can be transferred to other Chase cards, including the Sapphire Preferred and the new Sapphire Reserve card. This is where the card gains the most value. While cash back is valued at 1 cent per point, Chase Ultimate Rewards points carry a value as high as 1.5 cents per point and transfer to a large number of airline partners at a 1:1 ratio. If you factor in the high value of Ultimate Rewards points, the Freedom Unlimited card comes out ahead of almost every other cash-back card on the market. Furthermore, cardholders with multiple Chase Ultimate Rewards cards can combine the 1.5 percent rate that they earn on general spending on the Freedom Unlimited card with the 2 to 3 percent that they earn on travel and dining from their Chase Sapphire cards and the 5 percent that they earn on the rotating categories on the Chase Freedom card, to earn an even larger number of Ultimate Rewards points. Freedom Unlimited comes with a solid list of features for a cash-back card. Cardholders who travel will benefit from car rental insurance, trip cancellation and interruption insurance and lost luggage reimbursement. The card also affords purchase protections including extended warranty, price protection and return protection. On the down side, Chase Freedom Unlimited charges a 3 percent foreign transaction fee. If you are searching for a card to use for international travel, you may want to consider adding one of Chase’s premium travel cards – such as the Sapphire Preferred or Reserve – to your wallet. Why get the Chase Freedom Unlimited card? You want a cash back card with a large sign-up bonus. You want to earn cash back on your regular purchases at a higher rate than 1 percent. You prefer a low-maintenance rewards card with no special categories to enroll in or track. You prefer to keep all of your spending on one card. You want to spend a lot on one card without reaching a limit on your rewards. You’re looking for a cash-back card with valuable travel and purchase benefits. You want to pair this flat-rate card with other Chase Ultimate Rewards cards to earn extra points on purchases not covered by the bonus categories on the other cards. Use the card for your first $20,000 in purchases in the first year to max out the card’s 3 percent bonus. Use Chase Freedom Unlimited as your main card for all of your general purchases. Combine this card with a Sapphire card or the original Freedom card to maximize your Ultimate Rewards points. For additional advice, check out our complete guide to transferring a balance to your Chase card. Check out the review of the Chase Freedom Unlimited card from Holly Johnson at The Simple Dollar.